Beam shape and lightsail structure should be optimized for stability during the launch phase. In this period, on the order of 10 minutes, an illumination energy of order 1TJ is delivered to the sail. Because of this requirement, very small differences in the properties of the sail, or beam non-uniformities, will shift the center of pressure from the center of mass of the sail and so offset the sail thrust vector. Because of this, the sail properties and beam properties must be controlled to high precision. These properties include: composition, density, reflectivity, and absorptivity. By modulating the beam modes, get greater uniformity could be attained, and feedback between the nanocrafts and the beamer array would allow real-time adjustments. Currently, the optics coating industry achieves the required level of control on mass-produced items, with Angstrom-thick tolerance on common items such as cell phones and telescope optics. These manufacturing procedures and approaches are already mature, but the actual sail material is currently not available and will have to be developed. Mitigating approaches also include beam shaping and spinning of the sail to average out slight sail imperfections in its properties. Benford, J., Benford, G., Gornostaeva, O., Garate, E., Anderson, M., Prichard, A. and Harris, H. “Experimental Tests of Beam-Riding Sail Dynamics”, Proc. Space Technology and Applications International Forum (STAIF-2002), Space Exploration Technology Conf, AIP Conf. Proc. 608, ISBN 0-7354-0052-0, pg. 457, (2002). For this reason I already somewhere here wrote. On the surface of the sail for control can be applied slings in the form of strips with a thickness of about 100 nm from Nickel-Titanium alloy with shape memory effect, as in the 1980s in the experiment "Crab" on the space station "Mir". Then by changing their shape sail is intended to change shape when heated by the laser beam. regulating the reflectivity/transparency. This should give very fast control to keep the sail on beam, i would think it best to use four beams one for each segment of the sail, this should also allow ground control of the sail as well. "I propose the sail to be in the shape of a flat cone to be self-stabilizing. Define direction of travel as up. The tip of the cone would point down, with the load hanging below it. When a perturbation tips the cone, say, to the left, more light will strike the left side, pushing the cone back to the right. This negative feedback provides static stability similar to aircraft with horizontal tail stabilizers. The beam cross section should be such that the intensity is slightly less in the center than at the outer ring, so that the sail will be pushed back towards the center of the beam whenever it drifts away from it. The profile should be optimized to minimize diffraction / maximize collimation." The problem with an inverted cone (convex toward the beam source) is that it is unstable to simple lateral translation, transverse to the beam. If it moves off the center it will experience a force driving it further away. For comparison consider the stability of a cone that is not inverted, is concave toward the source, has its apex in the direction of travel so that the beam hits it from below. 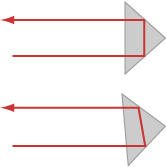 In the following diagram you can see on the left that when the sail is centered on the beam there is no net sideways force. But on the right, if the sail moves off center, a sideways force tends to restore the sail to its original position (see attachment). This restoring force is what makes sails concave toward the source stable. In addition the forces keep the sail in tension. I leave it to the reader to use this simple graphic approach to show that there is no restoring force for translation of a cone convex to the beam. Mr. Zhou is correct in that a sail convex toward the source is stable against rotational (pitch and yaw) instabilities. But a further difficulty is a sail convex toward the source tends to collapse because the forces of the beam are net inward, so act to make it collapse like a an umbrella closing. Gurkirpal Singh of JPL demonstrated stability and instability of a sail on a beam in a dynamic simulation in 2000. He showed that sails concave to the beam could ride a beam stably. The Benford brothers, Gregory and James, at UC Irvine in 2002, demonstrated stable beam-riding of a conical sail on a microwave beam experimentally. experiments by the Benford brothers in 2003. They measured the restoring force on a sail. In 2003, Chaouki Abdallah and team at UNM, with a 3D dynamics simulation, confirmed that the conical sail is the most passively stable shape, while other shapes, such as inverse conical, are not stable. Mr. Zhou is correct in saying that rotational and translational stability can be achieved with annular-shaped beams and sails. The center section stabilizes sail against translation, an outer ring stabilizes the sail against rotation and also maintains an outward tension. This will be an area of research for Starshot. No matter what the sail shape, it will have to be stabilized by spin at a high rotation rate in order to provide long-term stability against tumbling even after the beam acceleration is over. In my opinion a control of yaw, pitch and roll is needed for correcting the beam force to maintain stability of the probe. I suggest that the mothership are equipped with range measurement at several points of the sail, following the nanoprobe during the shoot. This would be without interference from atmosphere and gives exact position of the probes axis and how well it is centered on the beam. The mothership sends correcting signals to the laser to adjust power in any given area of the sail (many lasers). This will keep the probe centered on the beam (course) and stability of axis. In this case no extra electronics and power consuming instruments is needed on the probe. Aka weight. Also correction of axis can be done when initial shoot is over, it´s difficult to turn down that much power in a sail smoothly. Also Beamer should be able to start and stop in sequence such as smooth and controlled take-off and turn off is achieved. Also a good control of such as this can make other sail shapes possible. Would a laser unit as part of the craft work? After initial launch perhaps further long term propulsion can be provided with a laser unit onboard. The idea is that it would provide even more speed in the long term, have no atmosphere interference between it and the sail, it'll be super accurate, in cruise phase it can point ahead of the crafts path to divert dust and particles, and be used a stronger communication laser unit. The total systems needs to be strong enough to survive up to 1micron impacts. Why not use the sail as a shield so to speak? If more weight can be stripped from the other system by not having to structurally absorb a strike.. Sail can be larger? Larger target easier to stay on target. Use A cone concave to beam source, mount the rest of the structure within the cone opening (so the sail will protect the components from strike) with the mass of components equally distributed around the cone opening, thus if spin does occur it stays stable. you can also put some reflective material on the components in the event beam is off target won't potentially damage them well as reflecting the beam back into the cone . We could potentially use a 2D laser stack at the centre of the sail to be used as a laser reference to the rest of the back of the sail. If on the surface of the back of the sail we had line of sight sensors that looked and took reference data from the 2D laser stack it could be used to control the surface reflectivity/transparency and therefore could actively control the sails surface response to the driving lasers. This reference 2D laser could also be used to control the surface to form a comms/mirror as well to fair precision. We could potentially use a 2D laser stack at the centre of the sail to be used as a laser reference to the rest of the back of the sail. If on the surface of the back of the sail we had line of sight sensors that looked and took reference data from the 2D laser stack it could be used to control the surface reflectivity/transparency and therefore could actively control the sails surface response to the driving lasers. This reference 2D laser could also be used to control the surface to form a comms/mirror as well to fair precision." This is a reasonable solution. We need to be careful in finding the lowest mass approach. We only have a mass budget of one gram which means we need multi use devices. We currently are looking a several different approaches and this a clear leader. "This is a reasonable solution. We need to be careful in finding the lowest mass approach. We only have a mass budget of one gram which means we need multi use devices. We currently are looking a several different approaches and this a clear leader. - Avi Loeb, Breakthrough Starshot"
If we use pyramids taking advantage of the total internal reflection principle we could reduce the mass down quite a bit, the material between the pyramids can be a polymer to aid flexibility, lower weight and can be coated with a reflective metal to act as a telescope with a high surface area. With the light sensitive control sensors they can distributed around the sail surface and locally electrical connected to a nest of reflectivity/transparency control pyramids (truncated) which would minimise weight. If we had these pyramids using total internal reflection or have a dielectric mirror designed in a cringle cut 45 degree configuration we could use the retroflective effect where the incident beam is always parallel to the reflected beam. In this configuration the forces that wish to make it unstable as in a purely reflective mirror are significantly reduced and will allow us more time to counter any destabilising events. Although the 45 degree cringle cut design will weight more the stabilising advantage could well out weight the negative mass gain. Please sign in to be able to add new comments.